"Cosine" redirects here. For the similarity measure, see Cosine similarity. Base of trigonometry: if two right triangles have equal acute angles, they are similar, so their side lengths are proportional. Proportionality constants are written within the image: sin θ, cos θ, tan θ, where θ is the common measure of five acute angles. The most familiar trigonometric functions are the sine, cosine, and tangent. In the context of the standard unit circle (a circle with radius 1 unit), where a triangle is formed by a ray starting at the origin and making some angle with the x-axis, the sine of the angle gives the length of the y-component (the opposite to the angle or the rise) of the triangle, the cosine gives the length of the x-component (the adjacent of the angle or the run), and the tangent function gives the slope (y-component divided by the x-component). More precise definitions are detailed below. Trigonometric functions are commonly defined as ratios of two sides of a right triangle containing the angle, and can equivalently be defined as the lengths of various line segments from a unit circle. More modern definitions express them as infinite series or as solutions of certain differential equations, allowing their extension to arbitrary positive and negative values and even to complex numbers. Trigonometric functions have a wide range of uses including computing unknown lengths and angles in triangles (often right triangles). In this use, trigonometric functions are used, for instance, in navigation, engineering, and physics. A common use in elementary physics is resolving a vector into Cartesian coordinates. The sine and cosine functions are also commonly used to model periodic function phenomena such as sound and light waves, the position and velocity of harmonic oscillators, sunlight intensity and day length, and average temperature variations through the year. In modern usage, there are six basic trigonometric functions, tabulated here with equations that relate them to one another. Especially with the last four, these relations are often taken as the definitions of those functions, but one can define them equally well geometrically, or by other means, and then derive these relations. 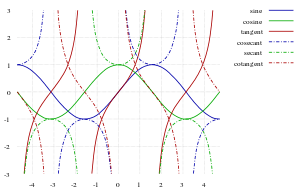 Top: Trigonometric function sin θ for selected angles θ, π − θ, π + θ, and 2π − θ in the four quadrants. Bottom: Graph of sine function versus angle. Angles from the top panel are identified. The notion that there should be some standard correspondence between the lengths of the sides of a triangle and the angles of the triangle comes as soon as one recognizes that similar triangles maintain the same ratios between their sides. That is, for any similar triangle the ratio of the hypotenuse (for example) and another of the sides remains the same. If the hypotenuse is twice as long, so are the sides. It is these ratios that the trigonometric functions express. In ordinary Euclidean geometry, according to the triangle postulate, the inside angles of every triangle total 180° (π radians). Therefore, in a right-angled triangle, the two non-right angles total 90° (π/2 radians), so each of these angles must be in the range of (0°,90°) as expressed in interval notation. The following definitions apply to angles in this 0° – 90° range. They can be extended to the full set of real arguments by using the unit circle, or by requiring certain symmetries and that they be periodic functions. For example, the figure shows sin(θ) for angles θ, π − θ, π + θ, and 2π − θ depicted on the unit circle (top) and as a graph (bottom). The value of the sine repeats itself apart from sign in all four quadrants, and if the range of θ is extended to additional rotations, this behavior repeats periodically with a period 2π. The trigonometric functions are summarized in the following table and described in more detail below. The angle θ is the angle between the hypotenuse and the adjacent line – the angle at A in the accompanying diagram. The sine, tangent, and secant functions of an angle constructed geometrically in terms of a unit circle. The number θ is the length of the curve; thus angles are being measured in radians. The secant and tangent functions rely on a fixed vertical line and the sine function on a moving vertical line. ("Fixed" in this context means not moving as θ changes; "moving" means depending on θ.) Thus, as θ goes from 0 up to a right angle, sin θ goes from 0 to 1, tan θ goes from 0 to ∞, and sec θ goes from 1 to ∞. 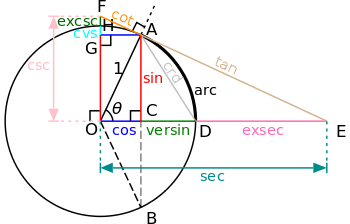 The cosine, cotangent, and cosecant functions of an angle θ constructed geometrically in terms of a unit circle. The functions whose names have the prefix co- use horizontal lines where the others use vertical lines. This ratio does not depend on the size of the particular right triangle chosen, as long as it contains the angle A, since all such triangles are similar. 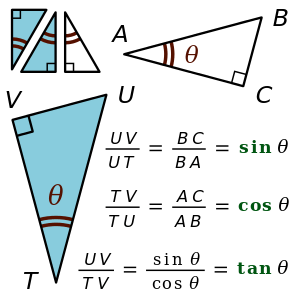 The acronyms "SOH-CAH-TOA" ("soak-a-toe", "sock-a-toa", "so-kah-toa") and "OHSAHCOAT" are commonly used trigonometric mnemonics for these ratios. "Ctg" redirects here. For other uses, see CTG (disambiguation). The remaining three functions are best defined using the above three functions. It is so called because it represents the line that cuts the circle (from Latin: secare, to cut). "Sine is first, rise is first" meaning that Sine takes the angle of the line segment and tells its vertical rise when the length of the line is 1. "Cosine is second, run is second" meaning that Cosine takes the angle of the line segment and tells its horizontal run when the length of the line is 1. "Tangent combines the rise and run" meaning that Tangent takes the angle of the line segment and tells its slope; or alternatively, tells the vertical rise when the line segment's horizontal run is 1. 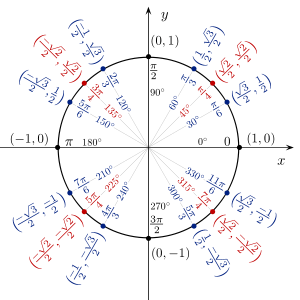 The unit circle, with some points labeled with their Cartesian coordinates and the corresponding angles in radians and degrees. Signs of trigonometric functions in each quadrant. The mnemonic "all science teachers (are) crazy" lists the functions which are positive from quadrants I to IV. This is a variation on the mnemonic "All Students Take Calculus". The six trigonometric functions can also be defined in terms of the unit circle, the circle of radius one centered at the origin. The unit circle relies on right triangles for most angles. The unit circle definition does, however, permit the definition of the trigonometric functions for all positive and negative arguments, not just for angles between 0 and π/2 radians. Let us consider the right triangle whose vertexes are the point P, the center of the circle O, and the point H of the x-axis, that has the same x-coordinate as P. The radius of the circle is equal to the hypotenuse OP, and has length 1, so we have sin(θ) = y/1 and cos(θ) = x/1. The unit circle can be thought of as a way of looking at an infinite number of triangles by varying the lengths of their legs but keeping the lengths of their hypotenuses equal to 1. The sine and cosine functions graphed on the Cartesian plane. Animation showing the relationship between the unit circle and the sine and cosine functions. for any angle θ and any integer k.
The smallest positive period of a periodic function is called the primitive period of the function. The primitive period of the sine or cosine is a full circle, i.e. 2π radians or 360 degrees. The primitive period of the secant, or cosecant is also a full circle, i.e. 2π radians or 360 degrees. The primitive period of the tangent or cotangent is only a half-circle, i.e. π radians or 180 degrees. The image at right includes a graph of the tangent function. Its θ-intercepts correspond to those of sin(θ) while its undefined values correspond to the θ-intercepts of cos(θ). The function changes slowly around angles of kπ, but changes rapidly at angles close to (k + 1/2)π. The graph of the tangent function also has a vertical asymptote at θ = (k + 1/2)π, the θ-intercepts of the cosine function, because the function approaches infinity as θ approaches (k + 1/2)π from the left and minus infinity as it approaches (k + 1/2)π from the right. All of the trigonometric functions of the angle θ can be constructed geometrically in terms of a unit circle centered at O.
Alternatively, all of the basic trigonometric functions can be defined in terms of a unit circle centered at O (as shown in the adjacent picture), and similar such geometric definitions were used historically. In particular, for a chord AB of the circle, where θ is half of the subtended angle, sin(θ) is AC (half of the chord), a definition introduced in India (see history). cos(θ) is the horizontal distance OC, and versin(θ) = 1 − cos(θ) is CD. tan(θ) is the length of the segment AE of the tangent line through A, hence the word tangent for this function. cot(θ) is another tangent segment, AF. sec(θ) = OE and csc(θ) = OF are segments of secant lines (intersecting the circle at two points), and can also be viewed as projections of OA along the tangent at A to the horizontal and vertical axes, respectively. DE is exsec(θ) = sec(θ) − 1 (the portion of the secant outside, or ex, the circle). respectively. Such simple expressions generally do not exist for other angles. For an angle which, measured in degrees, is a multiple of three, the sine and the cosine may be expressed in terms of square roots, as shown below. These values of the sine and the cosine may thus be constructed by ruler and compass. For an angle of an integer number of degrees, the sine and the cosine may be expressed in terms of square roots and the cube root of a non-real complex number. Galois theory allows to prove that, if the angle is not a multiple of 3°, non-real cube roots are unavoidable. For an angle which, measured in degrees, is a rational number, the sine and the cosine are algebraic numbers, which may be expressed in terms of nth roots. This results from the fact that the Galois groups of the cyclotomic polynomials are cyclic. For an angle which, measured in degrees, is not a rational number, then either the angle or both the sine and the cosine are transcendental numbers. This is a corollary of Baker's theorem, proved in 1966.
where z = a + ib, and a and b are the above algebraic expressions for, respectively, cos 3° and sin 3°, and the principal cube root (that is, the cube root with the largest real part) is to be taken. The sine function (blue) is closely approximated by its Taylor polynomial of degree 7 (pink) for a full cycle centered on the origin. Animation for the approximation of cosine via Taylor polynomials. The infinite series appearing in these identities are convergent in the whole complex plane and are often taken as the definitions of the sine and cosine functions of a complex variable. Another standard (and equivalent) definition of the sine and the cosine as functions of a complex variable is through their differential equation, below. En (below) is the nth Euler number. When this series for the tangent function is expressed in a form in which the denominators are the corresponding factorials, the numerators, called the "tangent numbers", have a combinatorial interpretation: they enumerate alternating permutations of finite sets of odd cardinality. The series itself can be found by a power series solution of the aforementioned differential equation. When this series for the secant function is expressed in a form in which the denominators are the corresponding factorials, the numerators, called the "secant numbers", have a combinatorial interpretation: they enumerate alternating permutations of finite sets of even cardinality. From a theorem in complex analysis, there is a unique analytic continuation of this real function to the domain of complex numbers. They have the same Taylor series, and so the trigonometric functions are defined on the complex numbers using the Taylor series above. Euler's formula illustrated with the three dimensional helix, starting with the 2D orthogonal components of the unit circle, sine and cosine (using θ = t). The latter identity, although primarily established for real x, remains valid for every complex x, and is called Euler's formula. It is also sometimes useful to express the complex sine and cosine functions in terms of the real and imaginary parts of their arguments. This exhibits a deep relationship between the complex sine and cosine functions and their real (sin, cos) and hyperbolic real (sinh, cosh) counterparts. the cosine function is the unique solution satisfying the initial condition . Since the sine and cosine functions are linearly independent, together they form a basis of V. This method of defining the sine and cosine functions is essentially equivalent to using Euler's formula. (See linear differential equation.) It turns out that this differential equation can be used not only to define the sine and cosine functions but also to prove the trigonometric identities for the sine and cosine functions. Further, the observation that sine and cosine satisfies y″ = −y means that they are eigenfunctions of the second-derivative operator. satisfying the initial condition y(0) = 0. There is a very interesting visual proof that the tangent function satisfies this differential equation. then the derivatives will scale by amplitude. The cosine's second derivative behaves similarly. This means that these sines and cosines are different functions, and that the fourth derivative of sine will be sine again only if the argument is in radians. Other key relationships are the sum and difference formulas, which give the sine and cosine of the sum and difference of two angles in terms of sines and cosines of the angles themselves. These can be derived geometrically, using arguments that date to Ptolemy. One can also produce them algebraically using Euler's formula. When the two angles are equal, the sum formulas reduce to simpler equations known as the double-angle formulae. These identities can also be used to derive the product-to-sum identities that were used in antiquity to transform the product of two numbers into a sum of numbers and greatly speed operations, much like the logarithm function. For integrals and derivatives of trigonometric functions, see the relevant sections of Differentiation of trigonometric functions, Lists of integrals and List of integrals of trigonometric functions. Below is the list of the derivatives and integrals of the six basic trigonometric functions. The number C is a constant of integration. Other derivations, starting from other functional equations, are also possible, and such derivations can be extended to the complex numbers. As an example, this derivation can be used to define trigonometry in Galois fields. 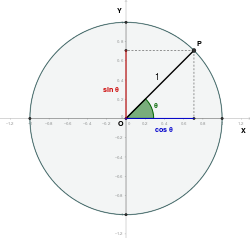 The computation of trigonometric functions is a complicated subject, which can today be avoided by most people because of the widespread availability of computers and scientific calculators that provide built-in trigonometric functions for any angle. This section, however, describes details of their computation in three important contexts: the historical use of trigonometric tables, the modern techniques used by computers, and a few "important" angles where simple exact values are easily found. The first step in computing any trigonometric function is range reduction—reducing the given angle to a "reduced angle" inside a small range of angles, say 0 to π/2, using the periodicity and symmetries of the trigonometric functions. Prior to computers, people typically evaluated trigonometric functions by interpolating from a detailed table of their values, calculated to many significant figures. Such tables have been available for as long as trigonometric functions have been described (see History below), and were typically generated by repeated application of the half-angle and angle-addition identities starting from a known value (such as sin(π/2) = 1). Modern computers use a variety of techniques. One common method, especially on higher-end processors with floating point units, is to combine a polynomial or rational approximation (such as Chebyshev approximation, best uniform approximation, and Padé approximation, and typically for higher or variable precisions, Taylor and Laurent series) with range reduction and a table lookup—they first look up the closest angle in a small table, and then use the polynomial to compute the correction. Devices that lack hardware multipliers often use an algorithm called CORDIC (as well as related techniques), which uses only addition, subtraction, bitshift, and table lookup. These methods are commonly implemented in hardware floating-point units for performance reasons. For very high precision calculations, when series expansion convergence becomes too slow, trigonometric functions can be approximated by the arithmetic-geometric mean, which itself approximates the trigonometric function by the (complex) elliptic integral. Finally, for some simple angles, the values can be easily computed by hand using the Pythagorean theorem, as in the following examples. For example, the sine, cosine and tangent of any integer multiple of π/60 radians (3°) can be found exactly by hand. There are some commonly used special values in trigonometric functions, as shown in the following table. 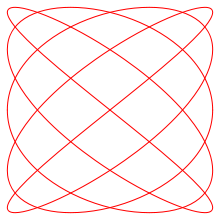 The symbol ∞ here represents the point at infinity on the projectively extended real line, the limit on the extended real line is +∞ on one side and -∞ on the other. The notations sin−1 and cos−1 are often used for arcsin and arccos, etc. When this notation is used, the inverse functions could be confused with the multiplicative inverses of the functions. 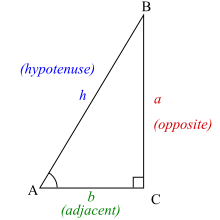 The notation using the "arc-" prefix avoids such confusion, though "arcsec" for arcsecant can be confused with "arcsecond". The trigonometric functions, as the name suggests, are of crucial importance in trigonometry, mainly because of the following two results. where R is the triangle's circumradius. A Lissajous curve, a figure formed with a trigonometry-based function. It can be proven by dividing the triangle into two right ones and using the above definition of sine. The law of sines is useful for computing the lengths of the unknown sides in a triangle if two angles and one side are known. This is a common situation occurring in triangulation, a technique to determine unknown distances by measuring two angles and an accessible enclosed distance. In this formula the angle at C is opposite to the side c. This theorem can be proven by dividing the triangle into two right ones and using the Pythagorean theorem. The law of cosines can be used to determine a side of a triangle if two sides and the angle between them are known. It can also be used to find the cosines of an angle (and consequently the angles themselves) if the lengths of all the sides are known. The explanation of the formulae in words would be cumbersome, but the patterns of sums and differences; for the lengths and corresponding opposite angles, are apparent in the theorem. In words the theorem is: the cotangent of a half-angle equals the ratio of the semi-perimeter minus the opposite side to the said angle, to the inradius for the triangle. The trigonometric functions are also important in physics. The sine and the cosine functions, for example, are used to describe simple harmonic motion, which models many natural phenomena, such as the movement of a mass attached to a spring and, for small angles, the pendular motion of a mass hanging by a string. The sine and cosine functions are one-dimensional projections of uniform circular motion. Trigonometric functions also prove to be useful in the study of general periodic functions. 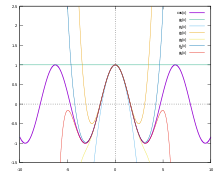 The characteristic wave patterns of periodic functions are useful for modeling recurring phenomena such as sound or light waves. In the animation of a square wave at top right it can be seen that just a few terms already produce a fairly good approximation. The superposition of several terms in the expansion of a sawtooth wave are shown underneath. While the early study of trigonometry can be traced to antiquity, the trigonometric functions as they are in use today were developed in the medieval period. The chord function was discovered by Hipparchus of Nicaea (180–125 BC) and Ptolemy of Roman Egypt (90–165 AD). The functions sine and cosine can be traced to the jyā and koti-jyā functions used in Gupta period Indian astronomy (Aryabhatiya, Surya Siddhanta), via translation from Sanskrit to Arabic and then from Arabic to Latin. All six trigonometric functions in current use were known in Islamic mathematics by the 9th century, as was the law of sines, used in solving triangles. al-Khwārizmī produced tables of sines, cosines and tangents. They were studied by authors including Omar Khayyám, Bhāskara II, Nasir al-Din al-Tusi, Jamshīd al-Kāshī (14th century), Ulugh Beg (14th century), Regiomontanus (1464), Rheticus, and Rheticus' student Valentinus Otho. Madhava of Sangamagrama (c. 1400) made early strides in the analysis of trigonometric functions in terms of infinite series. The terms tangent and secant were first introduced in 1583 by the Danish mathematician Thomas Fincke in his book Geometria rotundi. The first published use of the abbreviations sin, cos, and tan is by the 16th century French mathematician Albert Girard. In a paper published in 1682, Leibniz proved that sin x is not an algebraic function of x.
Leonhard Euler's Introductio in analysin infinitorum (1748) was mostly responsible for establishing the analytic treatment of trigonometric functions in Europe, also defining them as infinite series and presenting "Euler's formula", as well as the near-modern abbreviations sin., cos., tang., cot., sec., and cosec. A few functions were common historically, but are now seldom used, such as the chord (crd(θ) = 2 sin(θ/2)), the versine (versin(θ) = 1 − cos(θ) = 2 sin2(θ/2)) (which appeared in the earliest tables), the haversine (haversin(θ) = 1/2versin(θ) = sin2(θ/2)), the exsecant (exsec(θ) = sec(θ) − 1) and the excosecant (excsc(θ) = exsec(π/2 − θ) = csc(θ) − 1). Many more relations between these functions are listed in the article about trigonometric identities. The word sine derives from Latin sinus, meaning "bend; bay", and more specifically "the hanging fold of the upper part of a toga", "the bosom of a garment", which was chosen as the translation of what had been interpreted as the Arabic word jaib, meaning "pocket" or "fold" in twelfth-century European translations of works by Al-Battani and al-Khwārizmī. The choice was based on a misreading of the Arabic written form j-y-b (جيب), which itself originated as a transliteration from Sanskrit jīvā, which along with its synonym jyā (the standard Sanskrit term for the sine) translates to "bowstring", being in turn adopted from Ancient Greek χορδή "string". The word tangent comes from Latin tangens meaning "touching", since the line touches the circle of unit radius, whereas secant stems from Latin secans — "cutting" — since the line cuts the circle. The prefix "co-" (in "cosine", "cotangent", "cosecant") is found in Edmund Gunter's Canon triangulorum (1620), which defines the cosinus as an abbreviation for the sinus complementi (sine of the complementary angle) and proceeds to define the cotangens similarly. ↑ Oxford English Dictionary, cosine, n.
↑ Oxford English Dictionary, tangent, adj. and n.
↑ Oxford English Dictionary, secant, adj. and n.
1 2 3 See Boyer (1991). ↑ See Ahlfors, pages 43–44. ↑ Aigner, Martin; Ziegler, Günter M. (2000). Proofs from THE BOOK (Second ed.). Springer-Verlag. p. 149. ISBN 978-3-642-00855-9. ↑ Needham, Tristan. Visual Complex Analysis. ISBN 0-19-853446-9. ↑ Kannappan, Palaniappan (2009). Functional Equations and Inequalities with Applications. Springer. ISBN 978-0387894911. ↑ However, doing that while maintaining precision is nontrivial, and methods like Gal's accurate tables, Cody and Waite reduction, and Payne and Hanek reduction algorithms can be used. ↑ "R. P. Brent, "Fast Multiple-Precision Evaluation of Elementary Functions", J. ACM 23, 242 (1976).". ↑ The Universal Encyclopaedia of Mathematics, Pan Reference Books, 1976, page 529. English version George Allen and Unwin, 1964. Translated from the German version Meyers Rechenduden, 1960. ↑ The Universal Encyclopaedia of Mathematics, Pan Reference Books, 1976, page 530. English version George Allen and Unwin, 1964. Translated from the German version Meyers Rechenduden, 1960. ↑ Stanley J Farlow (1993). Partial differential equations for scientists and engineers (Reprint of Wiley 1982 ed.). Courier Dover Publications. p. 82. ISBN 0-486-67620-X. ↑ See for example, Gerald B Folland (2009). "Convergence and completeness". Fourier Analysis and its Applications (Reprint of Wadsworth & Brooks/Cole 1992 ed.). American Mathematical Society. pp. 77ff. ISBN 0-8218-4790-2. ↑ Boyer, Carl B. (1991). A History of Mathematics (Second ed.). John Wiley & Sons, Inc.. ISBN 0-471-54397-7, p. 210. ↑ Owen Gingerich (1986). "Islamic Astronomy". 254. Scientific American: 74. Archived from the original on 2013-10-19. Retrieved 2010-07-13. ↑ J J O'Connor and E F Robertson. "Madhava of Sangamagrama". School of Mathematics and Statistics University of St Andrews, Scotland. Retrieved 2007-09-08. ↑ Nicolás Bourbaki (1994). Elements of the History of Mathematics. Springer. ↑ The anglicized form is first recorded in 1593 in Thomas Fale's Horologiographia, the Art of Dialling. ↑ See Plofker, Mathematics in India, Princeton University Press, 2009, p. 257, also "Clark University". and Maor (1998), chapter 3, regarding the etymology. Lars Ahlfors, Complex Analysis: an introduction to the theory of analytic functions of one complex variable, second edition, McGraw-Hill Book Company, New York, 1966. Gal, Shmuel and Bachelis, Boris. An accurate elementary mathematical library for the IEEE floating point standard, ACM Transactions on Mathematical Software (1991). Kantabutra, Vitit, "On hardware for computing exponential and trigonometric functions," IEEE Trans. Computers 45 (3), 328–339 (1996). Maor, Eli, Trigonometric Delights, Princeton Univ. Press. (1998). Reprint edition (February 25, 2002): ISBN 0-691-09541-8. Weisstein, Eric W., "Tangent" from MathWorld, accessed 21 January 2006.